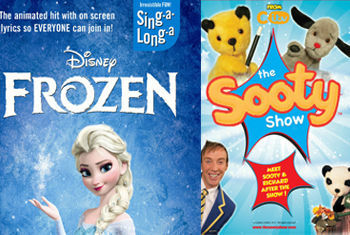 Singalonga Productions are delighted to announce that Disney's Frozen is the new Singalonga must see! A screening of Disney’s Frozen with lyrics on screen to help you sing along with Elsa and Anna and introduced by a live host, who will show you how to use your interactive fun pack and judge the fancy dress competition. Then just sit back and 'Let it Go'! YOU the audience can be the stars! Direct from Citv, Sooty heads into Bradford in a fabulous new show to delight the whole family. Joining the nation’s favourite bear will be Sweep, Soo and Sooty’s TV Partner Richard Cadell – who will be attempting to keep Sooty from getting up to mischief! Boy will he have his hands full! You can join in with all the fun and games and there's also a chance to meet Richard and Sooty after the show.